BANGI, 22 Oct 2012 – Achievements by a group of UKM students who emerged first runner-up in the Micro Robot World Cup Soccer Tournament (MiroSot) in Bristol earlier this year was acknowledged by its Vice Chancellor today. 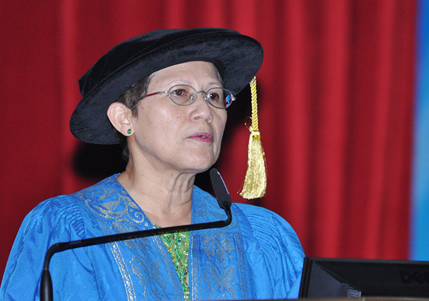 Speaking at the fifth session on the third day of UKM 40th Convocation today, she mentioned their achievement in the FIRA (Federation of International Robotics Association) Roboworld Cup 2012 as an example where its students had contributed to making a name for UKM on the world stage. FIRA Roboworld Cup is where the world’s best soccer robotics team gather to compete for various titles. Robot soccer is a competition of advanced robot technology within a confined space. It offers a challenging arena to the young generation and researchers working with autonomous mobile robotic systems. The robots are fully autonomous and not remotely controlled. Once programmed the robots will battle for the ball to score goals. A team is made up of four robots including one keeping goal. The UKM team lost to Edragon team from China in the finals because they had frequencies problems. They had earlier won the 6th FIRA (Federation of International Robotics Association) Malaysia Cup 2012 in Seberang Prai thereby chosen to represent Malaysia. Their success was not known by local media but they nevertheless earned UKM the reputation of having one of the best micro robotics team in the world.